Orthotics | Tarheel Podiatry Center, P.A. Dr. Lehtinen would like you to know a few things about orthotics and how they can help you. Everyone has approximately 32 bones in each leg – 28 of which are in the foot. You depend on these bones to move forward when you walk. With each step you take, more than 208 muscles are used which exert their effect on the feet, knees, hips, and lower back. Since most foot problems are the result of poor foot function – a misalignment between the bones and muscles of the feet – it is not surprising that many knee, hip, and back pains are the result of poorly functioning feet. The misalignment of the bones and muscles of the feet also cause many foot problems such as bunions, hammertoes, heel spurs, corns, calluses, and excessive pronation. The foot must act as a “functional unit”. The 28 bones of the foot must interact with each other to conduct the body weight into the ground. During walking, the bones of the foot must move in several directions at the same time. This allows the foot to perform the varied tasks of adapting to the ground, bearing body weight and propelling your body forward. 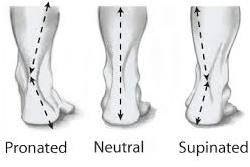 Because the foot must act as a functional unit, everyone has what is known as a “Neutral Position”. When your foot is in neutral position, all the bones are aligned in their best weight bearing position and your foot is performing at its best. If the bones of your feet are misaligned, they are no longer in their neutral position and are performing poorly. This is how painful foot problems can develop. ORTHOTICS CAN HELP. Orthotics are shoe inserts that are custom made for your individual foot problems. Worn inside your regular shoes, orthotics help make your feet function in their neutral position. Just as glasses help your eyes function more efficiently, orthotics are made for your individual foot problem so your feet perform at their best. The most significant force factor acting upon a person’s feet is their body weight. Each day you take thousands of steps and the bones of your feet must take that weight and distribute it. Orthotics help to redistribute the body weight evenly by creating a surface between your foot and the floor which causes you to function in your neutral position. A doctor or specialist will make a cast or impressions of your feet in their neutral position. These casts will be sent to a professional orthotic lab where technicians will fabricate your orthotics according to specific instructions. Orthotics are made of high strength plastics, cushioning, and pads which are formed to exact specifications. Use of Orthotic Devices: Orthotic devices are designed to improve your foot function. A period of adjustment is often necessary. Start by wearing the ortotics 1 hour the first day, 2 hours the second day and so forth until you can wear them all day. If you have discomfort, cut back on the increases in time until you can proceed again. It is most beneficial to wear the orthotics during the most productive time on your feet – at work, shopping, etc. Be certain to place the left orthotic in your left shoe and the right orthotic in your right shoe. The adjustment period varies from patient to patient. Always consult with your doctor. If your orthotics need adjustments, adjustments are free for 6 months.